Each of these pet urns is produced by the artist using the lost wax process to produce fine detail you see. 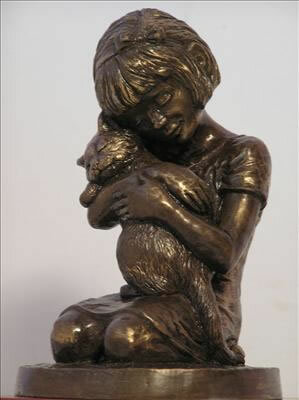 The sculpture has the look and feel of bronze, but is cold cast polymer with bronze additive and hand-finished with a bronze patina. The base of the solid oak urn is attached with four screws for easy loading. Size......................11.5 x 4 x 4"
*Weight is dimensional weight calculated for expedited shipping costs.